DBRS: Is the European Framework against Money Laundering Effective Enough? In light of the increase in cases of money laundering in Europe, in December 2018 the European Council adopted an action plan for enhanced monitoring. However, the wide variation in the effectiveness of controlsin different European jurisdictions is making supervision of money laundering less effective than if dealt with under a central authority. Moreover, DBRS notes that penalties continue to vary and depend on each European jurisdictions’s legal framework. In 2018, there has been an increase in the number of instances of alleged money laundering involving banks that are directly supervised by the European Central Bank (ECB). This paper focuses on European banks that have breached money laundering, terrorist financing or sanction laws, and got sanctioned between 2010-2018. The range of cases includes two categories in DBRS’s view. The first category refers to lack of controls or breaches in internal controls, as well as failure to Know Your Customer (KYC), generally including banks lacking effective systems to detect and prevent money laundering over a defined period. The second category includes cases of violations of sanctions (the most common being violations of US sanctions imposed on countries such as Iran, Sudan, Cuba, and Russia) over a defined period. 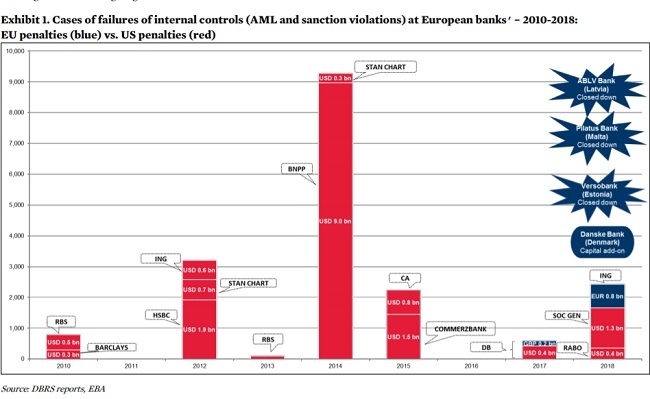 The number of cases (AML and sanction violations) in Europe increased to 7 cases in 2018 compared to less than 2 cases on average each year between 2010 and 2018 (see exhibit 1). Of the 7 cases in 2018, 6 cases fell under the first category (Cooperative Rabobank UA, ING Groep NV, Danske Bank A/S, A/S, Versobank AS, Pilatus Bank Plc and ABLV Bank, AS). In Denmark, Danske Bank A/S (Danske)’s investigation is still ongoing. DBRS notes that while the ECB possesses the sole authority to grant or withdraw a banking license for the banks it regulates, the responsibility for the supervision of compliance with Anti-Money Laundering (AML) requirements at banks of all sizes falls under the respective national AML supervisory authorities in each of the 28 EU countries. However, money laundering supervision can be less effective than if dealt with under a central authority. Nevertheless, efforts have been made to strengthen the European framework. 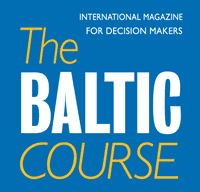 In December 2018, following a number of money laundering issues in Europe, most notably with Danske that disclosed an unprecedented amount of suspicious transfers from its Estonian branch (please see DBRS: Deficiencies in Controls Damage Danske Bank’s reputation), the European Council adopted an action plan to enhance monitoring across European jurisdictions. DBRS observes this plan is aiming at improving the national European supervisory authorities’ capacity to make better use of existing powers and tools. Among the eight key objectives is the importance of improving the exchange of information and collaboration between prudential and national AML supervisory authorities, as well as clarifying aspects related to the withdrawal of a bank’s authorisation in case of serious breaches. In addition, the European Council’s position on a proposal reinforcing the role of the European Banking Authority (EBA) was agreed. Giving more powers to the EBA aims to ensure that AML rules would be effectively applied in all member states and that all authorities cooperate closely with each other; and that, if needed, the EBA would be able to address decisions directly to individual banks as a last resort. As a result, DBRS views that cooperation should improve through the development of common standards, and coordination between different national supervisory authorities. However, DBRS considers that, given the large number of different European jurisdictions and disparity in resources allocated, AML supervision is unlikely to be as effective as if dealt with under one central authority. In particular, legal differences between European countries will remain, as demonstrated for example in Estonia. While tighter AML regulation took place in Estonia late 2018, with the government approving a draft law which established stricter penalties in its financial system and introduced reverse burden of proof on suspicious assets, this move only affected one country. Banks are expected to know their customers, as well as to respect international sanctions when dealing with certain countries. While DBRS observes large European banks have taken significant measures to boost compliance work since 2013, penalties for failures to report suspicious activities to relevant authorities will continue to vary and depend on each European jurisdiction's legal framework. Whether there could be clearer and stricter penalties for money-laundering in Europe remains un-addressed. European banks have been subject to penalties imposed by US authorities and their signal seems to be clear that the failure to report suspicious activity will result in severe penalties. Among various examples, the latest one was Société Générale SA that was fined USD 1.34 billion in November 2018 reflecting US penalties for illegal transactions to parties in countries subject to embargoes during a period between 2003 and 2013. Other cases prior to 2018 included BNP Paribas SA which got the largest fine to date for US sanction breaches - USD 9 billion in 2012 - highlighting how large US penalties can be. DBRS notes US authorities are investigating the Danske case also including Deutsche Bank AG (DB) for its role as a correspondent bank, looking at whether DB adequately monitored funds transferred from Danske’s Estonian branch. Beyond financial penalties, US authorities have also demonstrated a draconian approach in handling AML breaches when they denied access to US dollars to a bank based in Europe that was accused of large scale money laundering. 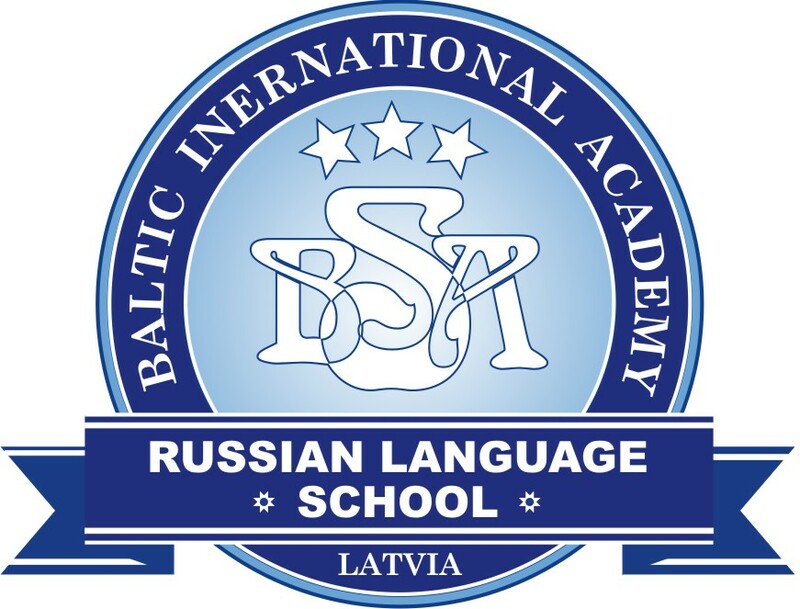 Early 2018, ABLV Bank, AS, a small Latvian bank, was found guilty of violating sanctions on North Korea and using bribery to influence Latvian officials. Seeking to impose penalties, the US Treasury Department’s Financial Crimes Enforcement Network of Money Laundering denied the bank funding in dollars, which resulted in the bank liquidating itself in February 2018. In Europe, there has been a recent increase in the number of penalties for bank breaching AML rules and violating sanctions, although the financial penalties have been much lower than in the US. Money laundering cases have recently risen and are increasingly being targeted by European national authorities. In September 2018 for instance, ING Groep NV had to pay EUR 775 mln to the Dutch AML authority (the Netherlands Public Prosecution Service) due to violations related to shortcomings in customer due diligence. DBRS also notes there can be higher regulatory requirements as a result. In Denmark, the Danish FSA imposed on Danske a Pillar II capital add-on of DKK 10 billion following the shortcomings in governance at the bank. There has also been a political agreement to tighten AML legislation in Denmark as well as to increase the ceiling for financial penalties in the Autumn 2018. So far though, Danske has not been fined by the Danish authorities. Considering the fact that Danske’s balancesheet represents more than 1.5 times Denmark’s GDP, the magnitude and severity of potential penalties may be politically more sensitive than if dealt with at a supranational level. At the same time, on January 29, 2019, the Danish FSA published 23 separate initiatives to tighten the Danish AML supervision. And DBRS notes one pillar considers “tougher consequences when a bank’s management fails to recognise its responsibility”, including the use of higher penalties for banks and their senior managers. In 2018, DBRS notes the ECB withdrew the authorisation to operate for three small European banks following requests from the respective national authorities, in Latvia, Malta and Estonia. Yet, the Latvian and Maltese cases were initially brought to attention by the US authorities. In Estonia, Versobank AS had total assets of only EUR 293 mln at end-2017 compared to the country’s GDP of 19.2 billion at end-2017.